Green Phoenix Farms has been working hard in the past few months to design and refine the operation of a few “ready-made” aquaponic systems for those individuals who are daunted by the prospect of designing and building their own system. We have done everything that we could to make these systems easy to operate and also as inexpensive as possible. 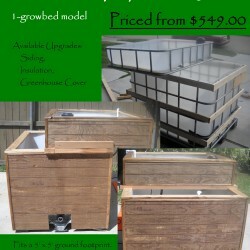 The Phoenix: 1-growbed and the Phoenix: 3-growbed systems are great backyard systems that are extremely functional and very cost efficient. We also offer the Terrae Cibus system which is slightly larger than the larger Phoenix system, but is also much more adaptable to expansion. Please check out out new Products: Aquaponics Systems page for our promotional posters. More information will be posted about these systems in the coming weeks and we hope to increase the number of systems that we will be able to offer in this style as well. Join us in the Good Food Revolution!